This bacon cheeseburger soup recipe is perfect to warm up with during the colder months while still enjoying a summer favorite. One of my favorite things to eat during the summer is a big juicy grilled cheeseburger topped with a couple slices of perfectly crisp bacon. As the weather gets cooler, I still love my burgers, but I often find myself wanting something a bit more comforting, hearty and hot. Like many, one of my favorite cold weather meals is making a big pot of soup. So, I couldn’t resist combining 2 of my favorites into this delicious bacon cheeseburger soup recipe. To me, this soup is the perfect combination of ingredients. It’s full of flavor and hearty with all the meat, creamy from the touch of dairy, and everything is made better with bacon and cheese, right? While you don’t usually find carrots or potatoes on most burgers, I find they add a nice touch to this bacon cheeseburger soup recipe, and help make it a one-dish meal. 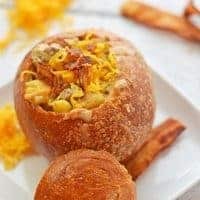 The bacon cheeseburger soup is great on its own, but we especially love it scooped into a warm crusty bread bowl and topped with an additional sprinkle of crisp bacon and shredded cheese. The leftovers also reheat very well, and you can even add some pasta to change up the leftovers to create a mock cheeseburger Hamburger Helper. 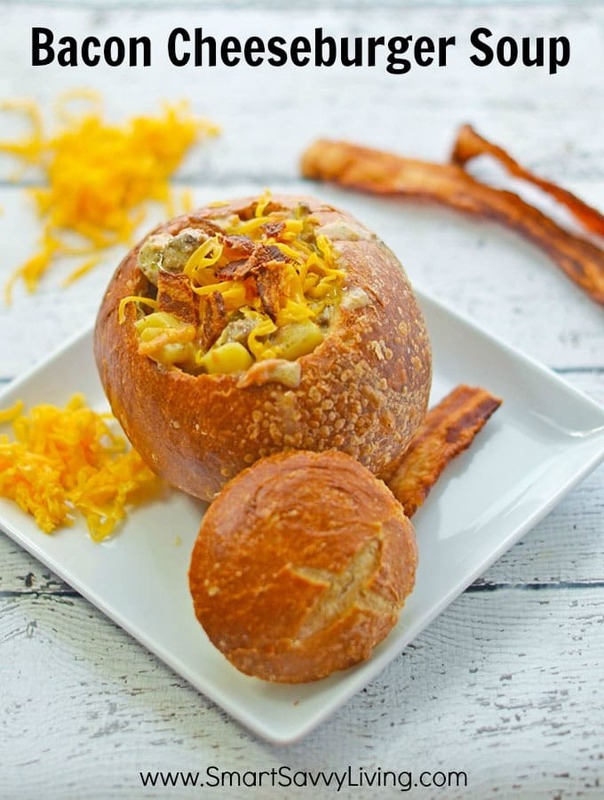 While a bread bowl makes this bacon cheeseburger soup even better, it’s also great just in a bowl. I’m often asked about some of my favorite kitchen tools when I make recipes. Here are a few of my must-haves (includes affiliate links) for making this bacon cheeseburger soup: Lodge 6-Quart Dutch Oven, Oxo Good Grips Stainless Steel Ladle, and Oxo Good Grips Saute Paddle. This bacon cheeseburger soup recipe combines all your favorite flavors of a bacon cheeseburger with the hearty warmness you love during the winter. Chop bacon into bite-sized pieces and cook until slightly crisp in a large dutch oven over medium-high heat. Once bacon is slightly crisp, add ground beef, breaking it up into bite-sized pieces with a large cooking spoon or spatula. Once beef has cooked through, drain off any extra fat from the meat, leaving about 2 Tablespoons of fat in the pot with the meat. Add in onion and carrot and cook until slightly tender, about 5 - 7 minutes. Stir in garlic and cook for about 1 minute. Stir in flour and cook for 2 - 3 minutes to cook out flour taste. Add in potatoes, broth and Worcestershire sauce, cover and simmer until potatoes are tender, about 10 - 15 minutes. Reduce heat to medium-low and stir in cream, half & half or milk. Stir in cheese until melted and season to taste with cayenne, salt and pepper. 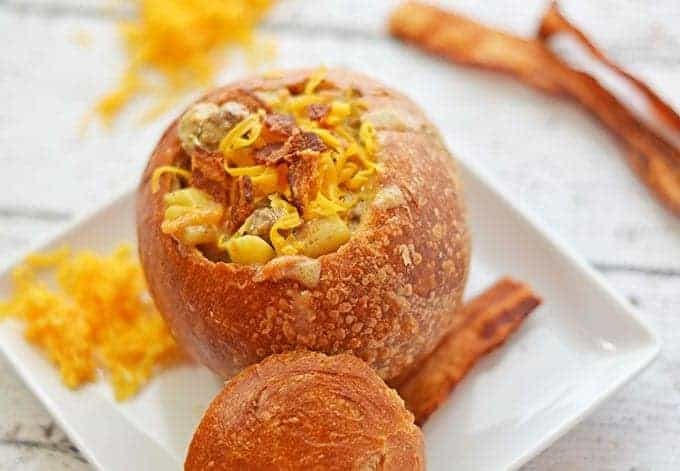 Serve immediately, in bread bowls with extra shredded cheese and crisp bacon for topping, if desired. If you have leftover burger buns, toasting them up as croutons to add to the top is also tasty! 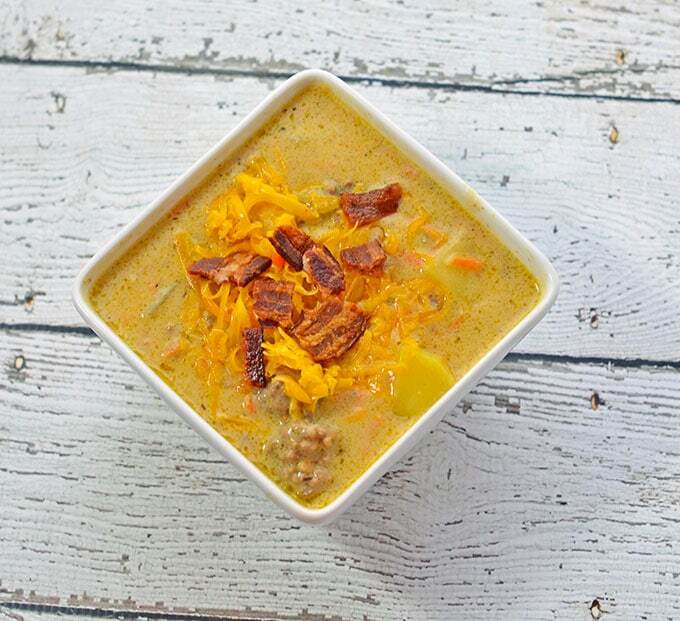 Like this bacon cheeseburger soup recipe? Check out our broccoli, bacon and potato chowder with cheese recipe! this looks very tasty. i love the bread bowl.